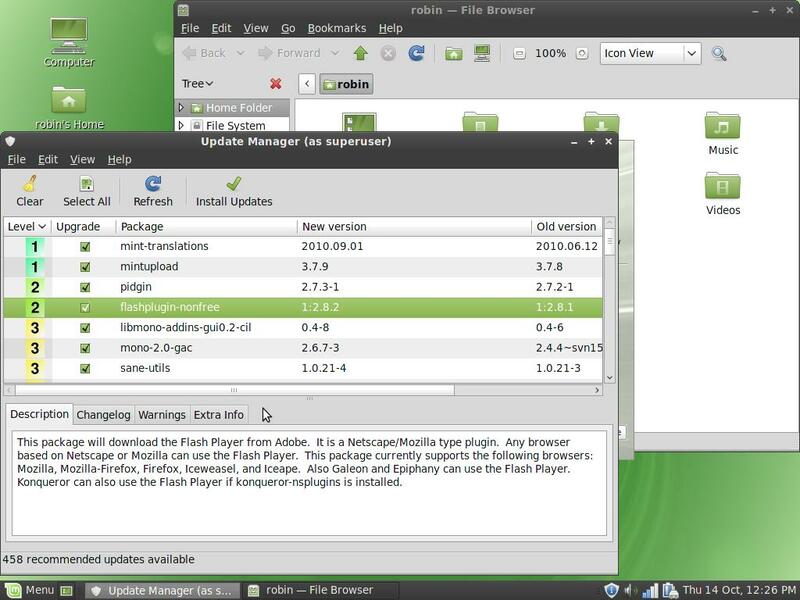 There is now a rolling release Linux Mint distro. It's been in the pipeline for a few months. 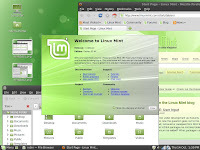 Linux Mint Debian Edition or LMDE is based on the Debian Unstable branch, as an experiment for 32-bit machines only. The Mint team retains the objective of making it an easy-to-use Windows replacement, question is, does the change under the hood keep it on track or de-rail the thing completely...? LMDE is compatible with the Debian repositories, not with Ubuntu. LMDE is 100% compatible with repositories designed for Debian Testing or Debian Squeeze (which is moderately faster than the equivalent Ubuntu). It is a rolling distribution which takes continual updates; while the ISO images are updated periodically you do not have to upgrade or re-install once it is on your system. This means it continually changes with each software update. The incremental changes make it less stable, don't go this route unless you're confident and patient in your problem solving skills. It's also slightly less polished on the desktop than the equivalent Ubuntu, but I can live with that. You can get to everything in desktop settings easily so you can change what you want (without resorting to programs like Ubuntu Tweak). Many features are necessarily based on Debian originals rather than the slick Ubuntu-based versions in Mint 9; the installer for example. The new Mint Backup works. this is different from the usual Mint Backup. It's not the most sophisticated and the scheduling is a little limited, but it works. This is a new build for the Debian strain, taking the design of the Mint Software manager including scores and user reviews, to which you can add. Being Debian-based, there's more than 30,000 packages and you can read user reviews of each application. Installs happen in the background so you can get on with other stuff rather than wait. To add or remove a program, find it in the Software Manager and then click the Install or Remove button. The Update Manager is the same trend-setter as in other Mint versions. The LMDE .iso file is just under 1Gb in size, so you'll need a DVD burner or a large USB stick. The iso is a Live DVD which runs as well as any other, so you can try it out before installing. The installer is straightforward, if simplified from Debian, which has a lots more options. However, it's up to standards of current distros, maybe a little quicker to finish than most. Compared to Ubuntu, partitioning is a step back to an earlier time. If you can pick your way through GParted, it all goes fine. It doesn't support every filesystem but then how many distro's do? The installer crashes if formatted partitions don't get a mount point. And you have to pick your own Timezone - you can manage that? There's no bootsplash screen but the login is the usual Gnome GDM. 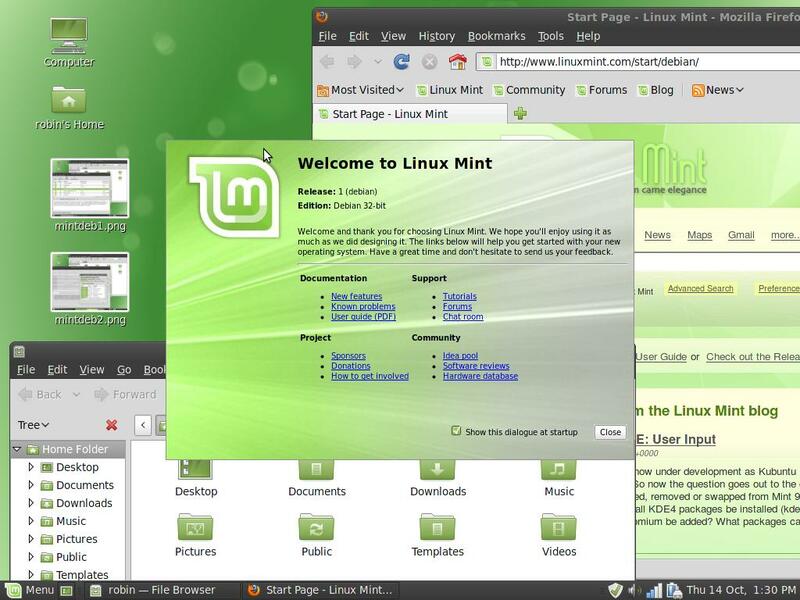 The Desktop looks like standard Mint Gnome, including the HTML Mint Welcome menu with links to the Community and Help pages and the Mint Menu familiar to Mint 9 users. You have the choice of all the Mint wallpapers (plus a couple of new ones) and themes. Mint comes with its standard suite of default programs including Gimp, F-Spot, Openoffice and Firefox (no Chrome, but you can get it yourself). Multimedia works out of the box as is the way with Mint; flash, YouTube and sound worked without configuring anything. VLC, Rhythymbox and Movie Player are default media applications with full set of controls for Pulse Audio. Networking also worked out of the box on my Belkin wireless dongle. The NDIS wrappers for legacy network adapters are included in this release. I'm ambivalent about the Debian derivative. Somehow it's not quite as polished as the Ubuntu derivative, especially now with 10.10. It's got the Mint 'stamp' on it, which means it's not (and can't be) as similar to Debian as is claimed. I suppose if you're not keen to be on Ubuntu's coat-tails, but like the Mint ethos, then this is the way to go. Ubuntu is definitely more progressive in terms of integration of social networking, notifiers and the like. I've liked Mint in all it's releases so far and this is like an old friend.